May 16, 2017, 2:01 p.m. It may not have felt like it on some days over the last week, but Britain is heading headlong into summer. With Brits preparing to dash outside to top up their tans, it is vital that they properly protect themselves – figures from Cancer Research UK show that skin cancer rates have more than doubled since the early 1990s. 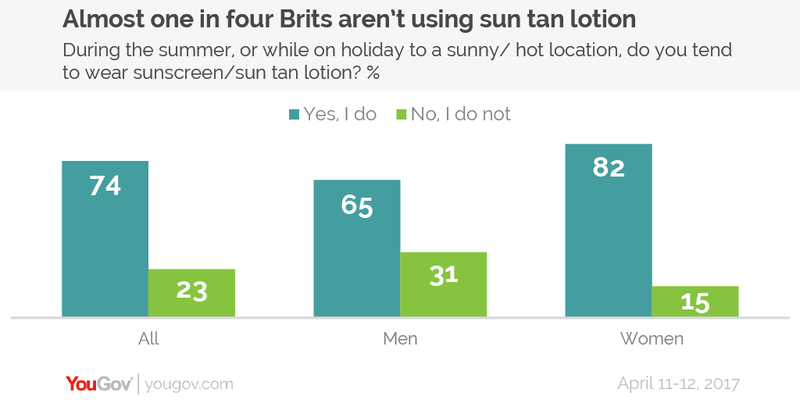 Now new YouGov research on the nation’s sun cream habits reveals that almost a quarter (23%) do not apply sunscreen during the summer or when on holiday, with men twice as likely as women to forego protection (31% vs 15%). The research suggests people are more cautious with their children, with 91% of parents in the survey with at least one child aged 11 or younger saying that they apply sun cream to their children (4% do not – the rest don’t know). However, it doesn’t matter how well covered you or your loved ones are if the sunscreen doesn’t work. The research finds that more than half of those who do use sun cream could be leaving themselves unprotected on holiday by using expired product. Sunscreen generally has a shelf-life of three years if stored properly. But after that point there’s no guarantee it will continue working, exposing Brits to the risk of skin damage. 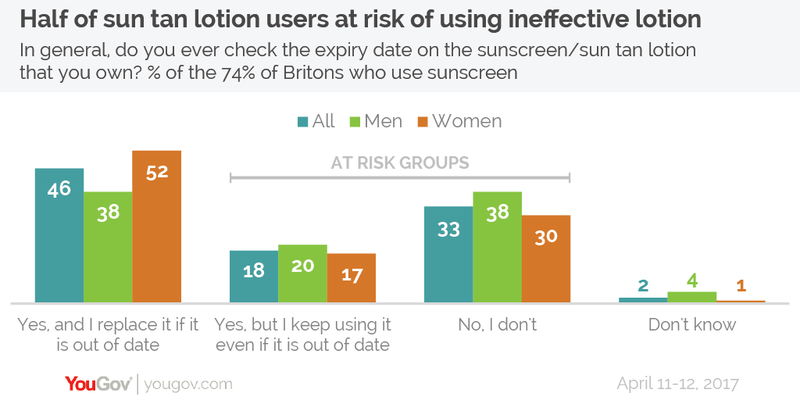 The results show that almost one in five sun cream wearers (18%) are wilfully using expired sun cream, whilst a further 33% are potentially unwittingly using it by never checking the expiry date. Skin cancer rates are higher and have risen faster among men than women and when it comes to out-of-date sunscreen, men are again at greater risk of harm than women. While 47% of women are wittingly or unwittingly are risk of using ineffective sun cream, this figure rises to 58% among men. Similarly, it’s not enough just to slap sun tan lotion on at the beginning of the day and that leave it at that. Sunscreen needs to re-applied throughout the day as otherwise the protection it provides wears off. The study finds that the majority of Brits (62%) wait between one and four hours between re-applying layers, with the most common time being between two and three hours (24%). As before, parents are also putting sun cream on their children more frequently than they do to themselves: half (50%) of are reapplying sunscreen to their kids every two hours or less. Children are also receiving stronger protection: 61% of parents are slathering the kids in SPF 50 or higher – a figure only 21% of adults are applying to themselves. Adults are most likely to covering themselves in SPF 30 sun cream (32%). To learn more about our Omnibus research, click here. Contact us now to reach national or bespoke groups in the UK or abroad with results delivered as soon as the very next day.